There’s a dish that seems to be making the rounds on catering menus these days: bibimbap. It’s a staple of Korean cuisine — and a perfectly balanced, complete meal: rice, meat, veggies, an egg, and any other kind of flavoring, from soy sauce to gochujang. 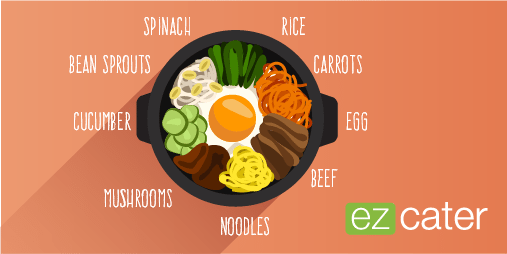 There are several variations of bibimbap. The most basic is served cold or room temperature — sticky rice, veggies, an egg, and perhaps some stir-fried beef. A bulgogi variation involves meat that’s been marinated in a soy-sugar-sesame mixture. For those who love their rice extra crunchy, there’s dolsot bibimbap, which is served in a hot stone pot. The rice continues cooking in the pot as it’s served, meaning you get those tasty, crispy bits that you can scrape off the bottom of the bowl. Rice Bar is DC’s accessible go-to for authentic Korean food, offering up a number of bibimbap platters to feed a big crowd (between 8 and 16 people). The favorite of all those large-format meals is the Kimchi Bibimbap Platter — which comes with veggies like sprouts, carrots, zucchini, and eggplant, plus the briny, funky, salty Korean condiment, kimchi (spicy pickled cabbage). The popular spot, Bomba Fusion Catering, smartly serves up an entire mix-and-match buffet, allowing people to construct their own custom bowls. Toppings to choose from include white rice, beef and pork bulgogi, kimchi, glass noodles, and more; along with creative sides like spicy kimchi dumplings. Durham’s most popular Korean food truck also offers a build-your-own bibimbap option, the standout feature of which is the sheer variety of sauces. In addition to gochujang, there are toppings like bulkogi spicy sauce (one of the truck’s proprietary offerings) or mandoo sauce (a sweet and sour soy sauce). You’re guaranteed to get a bowl that’s big on flavor. Boston’s playful take on Korean cuisine, Koy, serves up bibimbap in delicious snack form: Bulgogi Bibimbap Fritters. The crunchy morsels consist of seasoned rice rolled in beef and seasonal vegetables, served with a spicy aoli. They’re poppable, flavorful bites that’ll serve as the perfect appetizer. Another of the most popular trends in catering? Turning any kind of food (BBQ, sushi) into a burrito. Burrigato Catering in Minneapolis gives bibimbap the burrito treatment with very tasty results — the dish is spiked with sesame oil and gochujang, all rolled up in a fluffy tortilla. 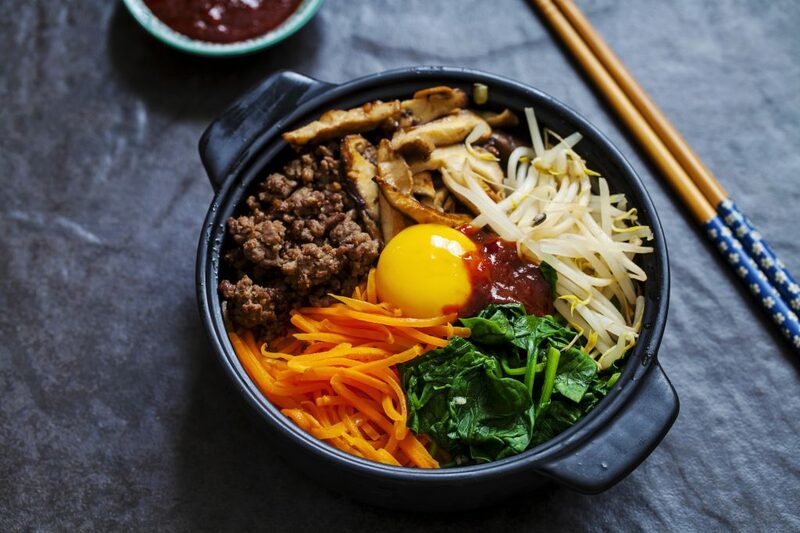 Ready to try out bibimbap?